Jan Price heard that computers were coming to her kindergarten classroom at Galt Elementary School in Lake Balboa in the heart of the San Fernando Valley. She was scared. That was a year ago. Now, the 71-year-old teacher is a champion of computers in the classroom. 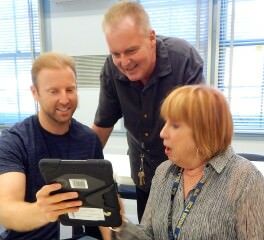 And, she’s the star of a video that’s becoming an inspiration for LAUSD teachers — or all teachers — who may be skeptical about using technology in teaching. In fact, Superintendent Ramon Cortines used her as an example at a recent Technology Initiative Task Force meeting. With 500 students, pre-kindergarten to fifth grades, and 25 teachers, Galt is one of the eight tech model schools that the district hopes to replicate throughout LAUSD. The students are each assigned an iPad-like device called a Nearpod, a mobile device with more interactive features. Principal Bill Albion heard some grumbling at first about the devices coming to his school, and he was concerned, too. Price credits her success with the district’s Instructional Technology Facilitator, Kevin Schulte, assigned to the school. Usually a consultant from the tech team is responsible for three to five schools to help with the implementation of technology. He said that Galt scored high as far as the quick acceptance of the devices among the teachers, parents and students. About 30 more schools at LAUSD will get devices for every student this year. “Veteran teachers become more proactive when they can visualize what can be done in the classroom,” said Schulte, who previously taught middle school math. Schulte said the district has gotten better in training teachers who are assigned the devices. Now, when Price can’t figure something out, she texts a question to Schulte, and he helps her. It’s not uncommon for teachers to retire earlier than planned in fear of technology coming to the classroom. The district is celebrating Price as an example for those who may have the same kind of anxiety. She said it took two months of training before she felt confident to handle the devices on her own. But now she can train her students and share their work with classmates during the 40 minutes or so each day they are using the devices. Price began teaching when she was 21, took some time off, and now has been teaching for 23 years. She still lectures the traditional way but notices that the devices can capture her class’s attention well. Already a few weeks into the school year her kindergartners are reading and taking quizzes. And as far as retirement?